Gentle cleansing that also hydrates. 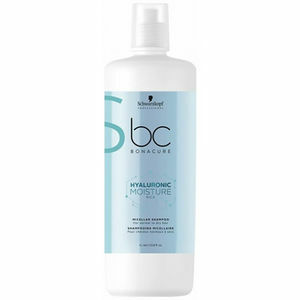 Schwarzkopf BC Bonacure Hyaluronic Moisture Kick Micellar Shampoo is the perfect moisturising shampoo for normal to dry, brittle or curly hair. As a part of the Bonacure Hair Care Range, it offers 100% hair replenishment, 100% resilience and 95% less hair breakage. If your clients' hair is is coarse, wavy and slightly porous, this shampoo will gently cleanse the scalp and hair. Further, it binds moisture to hair, preventing dehydration. Lightweight silicone-free conditioner that is perfect for balancing the moisture content in hair. A spray conditioner that rebalances the moisture level of hair and scalp to provide deep hydration. A deeply-hydrating, rebalancing treatment that's perfect for dry, wavy or curly hair that’s coarse or brittle. Available in a 750-ml pot. Pack of 100 disposable PVC shoulder capes that protect your clients' clothes from water and chemicals and help to keep your gowns looking good for longer too. Available in 4 colours: Black, Pink, Purple and White. Compact, easily portable hair washing tray that can turn any basin into a backwash. Ideal for mobile hairdressers and comfortable for clients. Box of 100 clear disposable shampoo capes. Fine shower spray with more than 2 metres of hose for freedom, versatility and salon-quality rinsing wherever you are.